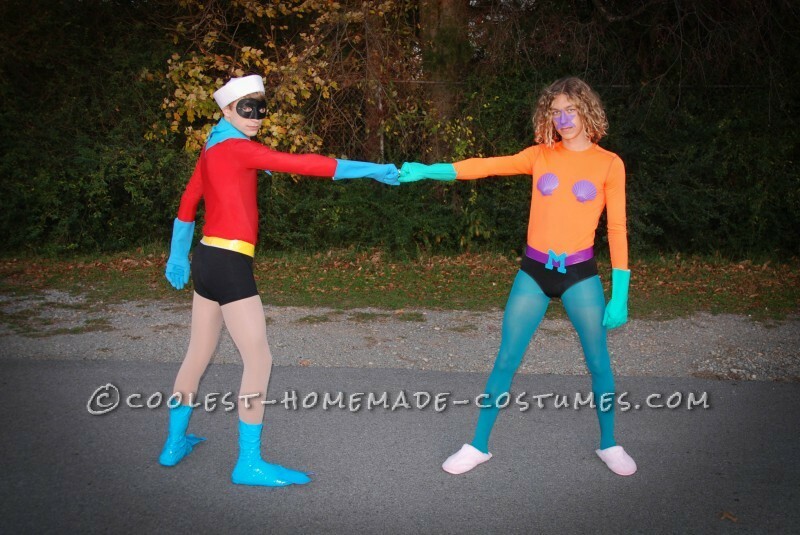 Funny Homemade Couple Costume: Mermaid Man and Barnacle Boy Unite! I have always made my boys costumes since day one and I think these have been two of my favorites to put together (besides their baby costumes). These were for my teenage son and his friend. 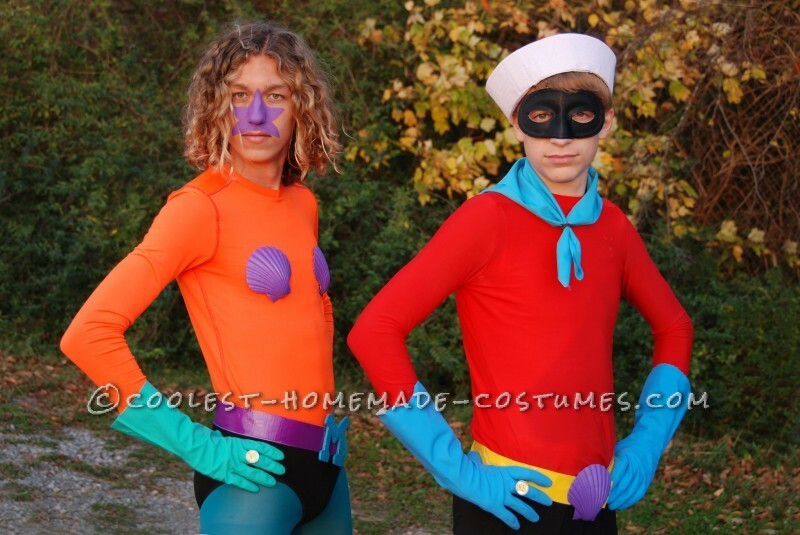 Mermaid Man and Barnacle Boy were really fun and not all that expensive to put together and I think they looked awesome. The only real assembly was on the belts and the boots. For the belts I placed two lengths of duct tape together on by their sticky sides. This made them thicker and easier to work with. I measured them to fit and placed some magnetic claps on them. These were not necessary, but I had them on hand and made them seem more authentic :). I then hot glued the shell and the “M” to the ends. For the shells on the Mermaid Man’s shift I sewed Velcro to the shirt and hot glued the other piece on the insides of the shells. This made it easier because of the way the shells are shaped and the shirt was very stretchy. I also painted the shells a couple days prior. The “M” was already painted blue but you can also find lots of the unfinished letters. For the boots, Barnacle Boy had on an old pair of shoes and I just wrapped the duct tape around them and up his leg. There are directions on pinterest for making duct tape boots a lot better than these. I ran out of time so I did them really fast and we just had to cut them off at the end of the night. I then painted the starfish on Mermaid Man and they were off to fight the Dirty Bubble and Man Ray! We went to take photos before they went out. This one is obviously Photoshopped but I hope they allow it anyways because it’s funny. They were sitting on boxes so they were easy to remove in the photo. It looks like they are riding in their Invisible Boat Mobile. what about mermaid man’s starfish nose? it is painted? Did the tights rip when you cut the boots? Wondering is blue knee socks would work as well.